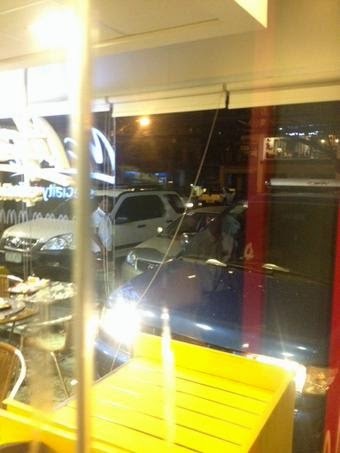 NAGA CITY--A blue vehicle smashed into McDonalds-Magsaysay Avenue Branch at around midnight yesterday (Feb. 20). According to Joshua Abante, the car was slowly negotiating the street before its driver attempted to park the vehicle in front of said establishment. "Ma-park po siya. Kaso dirediretso po si liko niya pasiring duman sa paparkan," said Abante in an exclusive interview with BICOLSTANDARD.COM. At that time, he was standing with his friend Jeannine del Monte in front of McDonalds. Abante said he was stunned when he saw the car headed straight at their direction. Thus, instinctively, he pulled his friend out of harm's way. "Mahahagip po kuta siya kadtong kotse kung dae ko siya nabutong," Abante said. The car then plowed through the glass wall of McDonalds. 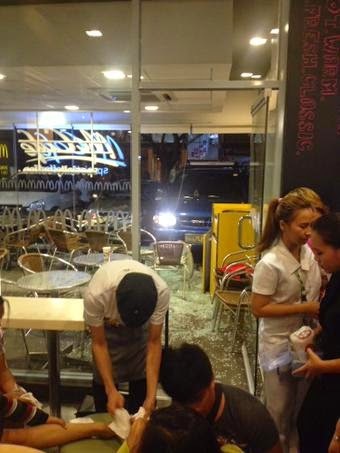 Shards of shattered glass caused some customers of the fast food chain to suffer minor injuries. Two nurses, who were fortunately at the scene, rendered first aid. Meanwhile, both the car's driver and his lady passenger appeared unhurt. The driver, however, looked shocked following the accident, described Abante. He and the passenger chose to remain inside the car after the mishap. It is still unknown if the driver was under the influence of alcohol at the time of the accident.